DRICORE. Subfloor R+ is the first and most important step towards creating a new living space as warm and comfortable as any other space in your home. DRICORE. is the one-step engineered subfloor solution that is specifically designed for basements. Concrete continually releases moisture. DRICORE Subfloor R+ panels have been designed with air gap technology to keep basement floors dry, comfortable and cozy throughout the entire year. DRICORE. Subfloor R+ combines high density Oriented Strand Board (OSB) and extruded polystyrene (XPS). With an R-Value of 3, DRICORE. Subfloor R+makes floors feel warmer. Enjoy a warm, comfortable basement for years to come! XPS' closed-cell structure resists moisture and maintains R-value. DRICORE. Subfloor R+ panels are fast and easy to install; a typical 500 square foot basement installs in an afternoon. AGT Products Inc. warrants to the Qualified Owner a limited 25 year warranty that its DRICORE Subfloor Panels (the Product) will be free from defects in materials, performance and workmanship related solely to the manufacture. 1-866-797-6374. LevelQuik ES Self-Leveling Underlayment helps level floors prior to the installation of ceramic tile, natural stone, resilient flooring, carpet, wood and other floor coverings. This quick-setting underlayment can be applied to 2 in. (5 cm) thick in one pour and seeks its own level in minutes. With proper installation, the use of LevelQuik ES can achieve an extra heavy rating for high impact use in food plants, dairies, breweries and kitchens. RedGard Seam Tape is a membrane fabric that is used for the seams between RedGard mat installations. RedGard Mat is designed differently than bonded membranes, with a sacrificial layer of fleece reinforced fabric that shears away or uncouples, when exposed to excessive substrate movement, absorbing stress and preserving the surface and integrity of the tile. RedGard Mat's bonding layers have reinforced fleece which locks mortar into the mat, ensuring strong, reliable installations. Ready-to-use, elastomeric, waterproofing and crack prevention membrane for all interior or exterior commercial and residential tile and stone installations. Easily applied with roller, trowel or sprayer producing a continuous moisture barrier with outstanding adhesion. Reduces crack transmission in ceramic tile or stone floors. Bonds directly to metal drains, PVC, stainless steel and ABS drain assemblies. Meets ANSI A118.10 for waterproofing membranes and ANSI A118.12 for crack isolation membranes. Meets Uniform Plumbing Code specifications for use as a shower pan liner. Listed with IAPMO R & T, File #4244 UPC<sup></sup>, ICC-ES ESR-1413. Can also be used as a slab-on-grade moisture barrier under resilient flooring. Skim Coat & Patch Cement Underlayment is a fast-setting, polymer-modified, cement-based compound that provides a smooth finish on interior and exterior subfloors prior to the installation of a wide variety of floor coverings. Mix with water to patch and level concrete and plywood up to 1/2" (13 mm) thick. When mixed with Patching & Leveling Latex Additive, it forms an ultra, high-strength system over ceramic tile, stone, terrazzo, vinyl sheet goods, VCT, cutback adhesive or as an embossed vinyl floor leveler. Install floor coverings in just 60 90 minutes. R+ Insulated Subfloor Panel 23.25 inch x 23.25 inch DRICORE. Subfloor R+ is the first and most important step towards creating a new living space as warm and comfortable as any other space in your home. DRICORE. is the one-step engineered subfloor solution that is specifically designed for basements. Concrete continually releases moisture. DRICORE Subfloor R+ panels have been designed with air gap technology to keep basement floors dry, comfortable and cozy throughout the entire year. DRICORE. Subfloor R+ combines high density Oriented Strand Board (OSB) and extruded polystyrene (XPS). With an R-Value of 3, DRICORE. Subfloor R+makes floors feel warmer. Enjoy a warm, comfortable basement for years to come! XPS' closed-cell structure resists moisture and maintains R-value. DRICORE. Subfloor R+ panels are fast and easy to install; a typical 500 square foot basement installs in an afternoon. 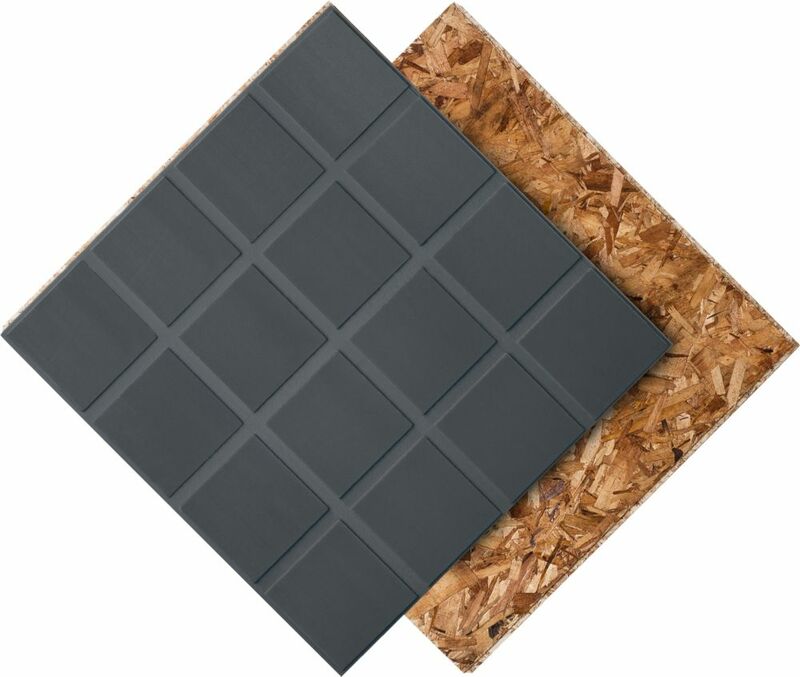 R+ Insulated Subfloor Panel 23.25 inch x 23.25 inch is rated 4.8 out of 5 by 76. Rated 4 out of 5 by Joshua from Very simple to install. Noticeable difference in air temperature. ... Very simple to install. Noticeable difference in air temperature. Rated 5 out of 5 by 645fts from Easy to lay even if you never did before.... Easy to lay even if you never did before. Rated 5 out of 5 by DIYDad from This works great in a humid basement. I love it. This works great in a humid basement. I love it. Rated 5 out of 5 by FoamFloorGuy from Exactly what you’d expect.... Exactly what you’d expect. Can I install these floor panels on a concrete floor and install a toilet and shower on it? I have an unfinished work shop in the basement . I have a table saw and a planer also drill press can I use this product under this equipment. Hello. I'm finishing a basement. The perimeter is already framed and sheet rocked. Could I install all floor panels first before erecting the partition walls? Would there be an issue with the weight? I think you should install the partitions first as the floor panels have a foam underlay that could shrink. Also the floor panels need to ability to move. What is square footage covered per package? Is it only 23&quot;&quot; x 23'&quot; = 1.9 feet ? Good afternoon Celia, Each panels is 23.25&quot; x 23.25&quot; when installed, provided nearly 4sq.ft. per panel. Panels are sold individually, to calculate the number of panels required for your application, divide your square footage by 3.3. The final number also includes a 10% overage in anticipation of cuts and error. Can Dricore be installed over the floor of an enclosed trailer? Yes, you can use our subfloor R+ panels over the floor of an enclosed trailer, provided your panels are protected from the elements. DRIcore Subfloor R+ panels are not waterproof, should the OSB become compromised they would require replacement. To help protect the panels, we recommend sealing the panels. Any surface treatments such as paints, stains, varnishes, and polyurethanes must be tested first for compatibility. To apply, brush or roll on 1 coat of a high quality primer prior to painting, or 2-3 coats of polyurethane or varnish to the surface of DRIcore panels. Ventilate well during this process. We also recommend fastening the panels to the floor. Use flat head 1/4&quot; x 2 1/4&quot; or 2 3/4&quot; concrete fasteners and a 3/16&quot; x 4 1/2&quot; drill bit to bore the holes. Yes, you may use the DRIcore Subfloor R+ over a wood subfloor. Can you glue vinyl plank flooring directly to product? Hello James. Not directly, please follow these instructions for SHEET VINYL AND VINYL TILES A 1/4&quot; plywood underlayment approved for use with sheet vinyl or adhesive-backed vinyl tiles should be fastened to the DRIcore panels. We do not recommend lauan plywood as an underlayment. Use 3/4&quot; flooring fasteners that do not penetrate the moisture barrier on the underside of the DRIcore panels. Do not glue the plywood underlayment to DRIcore panels. Do not glue adhesive-backed vinyl tiles directly to DRIcore panels. Glue the vinyl floor to the plywood underlayment according to the vinyl manufacturer's installation instructions. Only remove the 1/4&quot; wall spacers after the vinyl floor has been installed. Yes, you may do so using 2-1/4 x 1/4&quot; tapcon screws and a 4-1/2&quot; x 3/16&quot; drill bit to bore the holes. It is not necessary however, if you follow our installation instructions: ENGINEERED/SOLID HARDWOOD Follow the wood manufacturer's guidelines as to what can be installed at or above grade and below grade. The National Wood Flooring Association defines below grade as any part of a concrete floor that is 4&quot; or more below the soil level. Before installing glue-down or nail-down floors a 3/8&quot; plywood underlayment should be fastened to DRIcore using 18 gauge 3/4&quot; or 7/8&quot; narrow crown staples. When installing nail-down floors test a piece of the finished floor to make sure the fastener does not puncture the plastic membrane. Remove the 1/4&quot; wall spacers after the wood flooring has been installed. NOTE: Do not glue engineered hardwood floors directly to DRIcore panels.